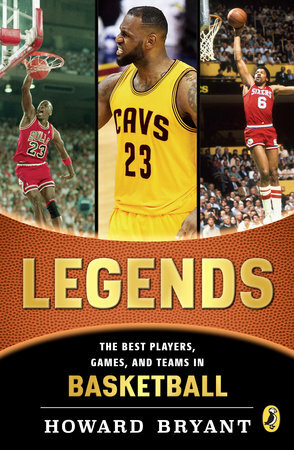 From Magic Johnson to Michael Jordan to LeBron James to Steph Curry, ESPN's Howard Bryant presents the best from the hardwood--a collection of NBA champions and superstars for young sports fans! Fast-paced, adrenaline-filled, and brimming with out-of-this-world athleticism, basketball has won the hearts of fans all across America—yet it is particularly popular among kids and teens. Giants of the game like Steph Curry, LeBron, and Michael Jordan have transcended the sport to become cultural icons and role models to young fans. From the cornfields of Indiana and the hills of North Carolina, to the urban sprawl of New York City, Chicago and L.A., love of the game stretches from coast to coast. Featuring Top Ten Lists to chew on and debate, and a Top 40-style Timeline of Key Moments in Basektball History, this comprehensive collection includes the greatest dynasties, from the Bill Russell-era Celtics, to the Magic Jonson-led Lakers, to the Jordan-led Bulls, right up to the Tim Duncan-led Spurs. All the greats take flight toward the hoop in this perfect book for young fans who dream about stepping on an NBA court. This one had the feel of a throwback championship series like in the old days when almost every position on both teams was filled by a future Hall of Famer. San Antonio, already with four championships, boasted superstars Tim Duncan, Manu Ginobili, Tony Parker, and a young, budding talent, Kawhi Leonard. On Mi­ami’s side, there was LeBron James, Dwyane Wade, Chris Bosh, and now, having defected from Boston, Ray Allen. That’s eight potential Hall of Fame players on one court to settle the NBA championship. Quite a matchup it was. The Heat, now with LeBron James, had reached the Finals in the two years since his arrival, and in 2013, as defending NBA champi­ons, did so again. James was the reigning NBA MVP and had won the award two years in a row. He’d also been named the Finals MVP the year before, but the Heat were not a one-man team. They also had Wade, and these two great players used their skills and bas­ketball IQ to take over different parts of the game. LeBron had been the lone wolf in Cleveland, and it had been a while since Shaq had left Miami, meaning Wade had been the undisputed leader on the Heat for the past few years. It had taken some time for the two stars to learn to share the court together, but they had finally begun to gel. With James and Wade at the center, Miami was full of excellent, perennial All-Stars, such as Allen and Bosh as well as terrific role players like three-point shooters Mike Miller and James Jones. They looked like a team that would con­sistently compete for the title for years to come. The Heat won sixty-six games in 2013, includ­ing twenty-seven in a row at one point. Wade suf­fered through injuries and wasn’t the same player he had been, but he was still a dangerous force. James, still, was the engine. He was playing at the top of his power, always an imposing and unstoppable force when driving to the basket, but now dangerous from mid-range and outside. If James had mastered his jump shot and was already impossible to guard when his six-foot-eight, 250-pound frame drove to the bas­ket, how could he be stopped? Meeting the Spurs was something of a rematch. The Heat had never met San Antonio in the Finals, but James had, as a member of the Cavaliers in the 2007 Finals. The Spurs had destroyed Cleveland in four straight games, and now James, no longer an un­derdog, had unfinished business of his own with Tim Duncan, Manu Ginobili, and Tony Parker. The teams split the first four games, but only the first matchup was actually competitive. In Game 1, James recorded a triple-double and was absolutely re­lentless rebounding the ball, finishing with 18. Yet he only scored 18 points, and Bosh and Wade had rela­tively quiet nights. Meanwhile, five members of the Spurs scored in the double digits, including a 21-point, 6-assist performance from Parker. Their team effort won the day as the Spurs defeated the Lakers 92–88. After that first game, hopes were high that each game would be just as tight. Yet the next three games were decided by 19, 36, and 16 points, with the Heat winning two out of three to even the series. Then in Game 5, Danny Green, the Spurs three-point specialist, hit six three-pointers in a 114–104 win. That game showcased the masterful efficiency of the San Antonio squad, one of the most fundamen­tally sound teams in recent years. They shot a re­markable 60 percent overall. The Spurs were heading to Miami with a 3-2 lead, just a win away from their fifth NBA title. On Miami’s home court, the Spurs led by 12 in the third and by 10 entering the final quarter, 75–65, but the Heat made a fierce comeback led by James, who quickly scored 11 of the Heat’s 20 points to start the quarter. During that run, down 77–70, the Heat’s dead-eye three-point shooter Mike Miller had a shoe come loose on the play, but he didn’t have time to put it back on as the play was still in progress. One shoe was all he needed. LeBron passed it to him, and Miller sunk a three. Suddenly, the Heat led 84–82 with 6:03 left in the game. Yet the Spurs were unimpressed. Smelling a ti­tle, Parker and Ginobili turned up the heat, scoring 10 consecutive points to give the Spurs a 94–89 lead with twenty-eight second left. To match up with Cleveland’s smaller lineup and to keep the poor-shooting Duncan off the free-throw line, Spurs coach Gregg Popovich removed him from the game. Duncan had scored 30 points through three quarters, but he was completely shut down in the fourth. Twenty-eight seconds away for San Antonio. With a five-point lead, the Spur’s victory seemed inevitable. The clock ticked, ticked, ticked, shaving seconds off the clock. Twenty-three seconds until James’s season would end in disappointment if he didn’t act fast. Cleveland got the ball back and kicked it to LeBron, who fired a three and missed. But Miller was there to tap the rebound back to James, who launched another three-pointer. Good! 94–92, Spurs. San Antonio ball, twenty seconds left. With 19.4 seconds left, Miller fouled Leonard. The rookie missed the first free throw but made the sec­ond, and extended the Spurs’ lead to 95–92. Miami brought the ball up, filled with a sense of desperation. With under ten seconds left, James fired up a game-tying three . . . no good! The ball was up in the air, up for grabs . . . 6.3 seconds left. Duncan watched from the bench. Bosh, the tallest man on the court, snared the rebound, and tapped it into the corner for Allen, the man who had set the record for most threes in a season in 2005–06. Allen threw up one more three with five seconds left . . . it went in! 95-95, 5.2 seconds left on the clock. One more op­portunity for San Antonio. Parker missed a jumper at the buzzer. The Spurs started out with another burst, rushing out to a 100–97 lead, but that was all the points they would score in overtime. They didn’t score for the fi­nal 2:42 of overtime while James and Allen closed the deal. The final score was 103–100. The series was tied at three games apiece. It was a crushing blow for the Spurs, losing in what many consider to be one of the greatest NBA Finals games ever. But there was still one more game to decide it all. The series should have been over. The season should have ended with the Spurs holding the cham­pionship, up by five with twenty-eight seconds left in Game 6, but they had lost. Champions, however, fight. Champions recover. The Spurs did fight, and they did recover in Game 7, but they did not win. Miami took the lead 72–71 to start the fourth quarter and fought off every charge. The Heat took the lead and held it. Leonard hit a three to cut the lead to 90–88, Cleveland, with two minutes left, but the Spurs would not score again. James hit for 37 points, Wade for 23. The Heat won 95–88, and claimed their second straight title. After playing all those years for losing teams in Seattle and Milwaukee, Ray Allen now had two titles, one from Boston in 2008, and now one in Miami. How’d they do it? How did they win that Game 6 when it had seemed all but over? Simple: they did what all coaches have hammered home since the dawn of sports—never give up and keep fighting until the very last second. The Spurs never forgot. They tasted the bitterness of losing that title every day for the next year, ev­ery practice, every game, keeping the sour memory fresh in their minds in an effort to get back to the Finals. They did just that, and even crushed the Heat in a rematch that lasted but five games to reclaim the championship. Weeks later, James left the Heat and returned to Cleveland, cutting short an era in Miami that many had thought would endure for years to come. But even in his brief stint with the Heat, James had taken Miami to four straight NBA Finals, the most consec­utive Finals trips by any player since Bill Russell. A potential dynasty ended, but the NBA kept moving forward. Yet even as the years went by, the memory of the 2013 NBA Finals lived on, the lasting impact of a hallmark standoff between two of the greatest teams of the decade. It’s why, as basketball fans, we watch until the fi­nal buzzer sounds.